Chemical Rinse by Lester Pools Inc.
Has your pool sat for a long time without use? Does it have a green hue? Chances are, you've had algae take up residence in your pool. Once you develop a "green" pool, the only way to combat it is with a chlorine rinse, otherwise known as a chlorine chemical bath. 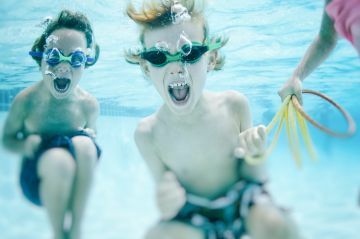 The pool experts at Lester Pools Inc. specialize in chlorine rinses for local pools, and we can help your pool get back into bathing suit shape quickly and safely. Chemical washing is not an easy task, and it must be done safely and properly. Lester Pools Inc. has been cleaning and maintaining pools since 2007, so you can trust that our experienced professionals will get the job done right. Chemical rinses for an extremely dirty or algae-contaminated pool will clean the water and the surface, make the pool safe for swimming once again. The chemical rinse process removes everything that should not be in your pool, such as oxidized metals, algae stains, dirt and debris. With the power of our chlorine wash, Lester Pools Inc. can bring your swimming pool back clean so you can get back to enjoying it! Now is the perfect time to have your pool cleaned and rinsed. Our process is guaranteed to get your pool back into shape. First, we drain your pool. Next, we apply a solution of chlorine and water over the bottom and sides of your pool. After scrubbing gently to remove algae growth, we thoroughly rinse the pool and remove the waste water. The final steps are to refill your pool and apply the correct chemicals to balance the pH. Contact Lester Pools Inc. today to see how we can return your pool to the hub where your entire family wants to spend time.